In celebration of the 101st anniversary of the grand opening of Hotel Galvez and Spa on Sunday, June 10, brunch guests will enjoy a special anniversary cake and receive a complimentary commemorative poster. Brunch is served from 11 a.m. to 2 p.m. and advance reservations are suggested. Hotel Galvez’ Sunday Brunch has been voted as Houston’s Top Brunch by OpenTable users and was recently featured in Southern Living as one Texas’ Best Brunches. Brunch is priced at $38.95 for adults; $32.95 for seniors; $22.95 for children (6-11); and children under 6 are complimentary. Brunch reservation can be made by calling (409) 765-7721 or by visiting www.BernardosAtHotelGalvez.com. That evening, dinner guests at Bernardo’s Restaurant will enjoy a complimentary dessert with their meal in celebration of the anniversary. The public is also invited to browse the hotel’s Hall of History which is located on the lower level and is a permanent exhibit at the property. Hotel Galvez & Spa, A Wyndham Grand® Hotel and National Trust Historic Hotel of America, is the only historic beachfront hotel on the Texas Gulf Coast. This 224-room, century-old hotel offers 13,000 square feet of meeting space, a 9,763-square-foot spa, fitness center, full-service restaurant, lobby bar and pool with a swim-up bar. The hotel is rated four diamonds by AAA and is owned by Galveston preservationist George Mitchell as part of Mitchell Historic Properties. 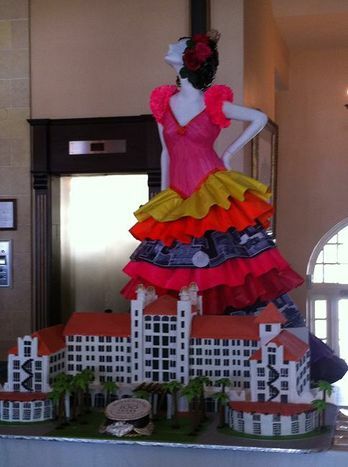 For reservations, call (800) WYNDHAM, or visit www.WyndhamHotelGalvez.com. Wyndham Hotels and Resorts, LLC and its affiliates, subsidiaries of Wyndham Worldwide Corporation (NYSE: WYN), offers upscale hotel and resort accommodations throughout the United States, Europe, China, Canada, Mexico and the Caribbean. All hotels are either franchised by the company or owned and/or managed by an affiliate or through a joint venture partner. For more information, visit www.wyndham.com. Galveston Island is a historic beach town located on the Gulf of Mexico just 50 miles from Houston. The island is best known as a vacation destination, offering 32 miles of beaches, a variety of family attractions, Texas’ premier cruise port and one of the largest and well-preserved concentrations of Victorian architecture in the country, including several National Historic Landmarks. Galveston Island is home to popular amusements such as Moody Gardens and Schlitterbahn Galveston Island Waterpark, as well as a variety of museums and recreational activities from surfing to birding. For more information on Galveston Island visit www.galveston.com or call 1-888-GAL-ISLE. Hotel Galvez & Spa will celebrate its 101st Anniversary by featuring a special anniversary cake during brunch on Sunday, June 10. All brunch guests will also receive a complimentary commemorative poster. Pictured is the cake from the 100th anniversary.